Jennifer Elie lives just minutes from Flushing Meadows, the historic site of the US Open. Since she was a young tennis player, competing in the event has been a dream of hers. She is now even closer to accomplishing that goal. 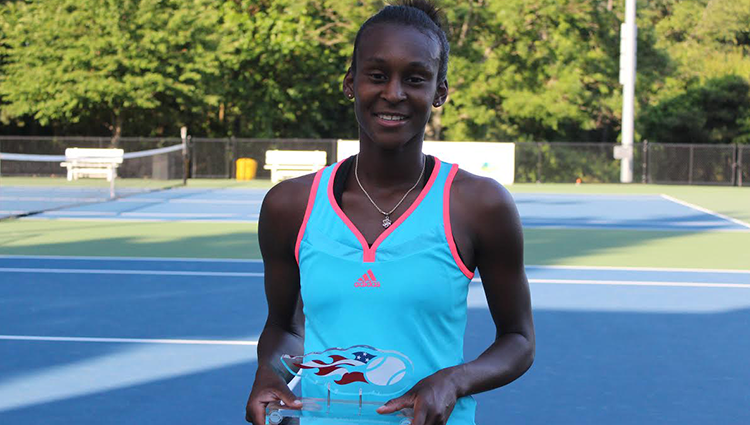 Elie, a 27-year-old native of New York, won the women’s singles draw at the US Open National Playoffs Middle States Qualifier, which took place in late June at New Jersey’s Mercer County Park. Elie now advances to the US Open National Playoffs in New Haven, CT, where she will compete against the women’s singles winners from the 12 other Sectional Qualifying Tournaments for a spot in the qualifying draw of the US Open. For Elie, motivation and skill are her ingredients to success, and feeling the drive of competition keeps her going. “I just love competing, traveling, playing tournaments [and] the adrenaline when you’re out there,” she said. Elie turned pro in 2003 after competing as a junior at the US Open and Australian Open. Elie then bounced around playing several tournaments throughout the world, competing in both singles and doubles. In 2012, Elie made her WTA Tournament debut at the 2012 Texas Open, where she reached the quarterfinals with her doubles partner, Asia Muhammed. She does all of this while still keeping family as her main priority. Throughout the tournament, Elie watched over her cousin, who was visiting New York from his home in Haiti. During her semi-final match on Monday afternoon, he watched her defeat Dartmouth standout Taylor Ng en route to the Tuesday night final. Elie’s younger sister also joined in support during the championship match against Ivy League Player of the Year, Lindsay Graff. Family seems to be a theme for Elie. Her coach and father, Kerner Elie, has been working with her for years, helping her develop her game and improve on the court. Humbled by the lack of early training, Elie uses her long road to this point as motivation. Currently ranked at 488, Elie aspires to participate in more advanced match play. “The US Open, that’s the goal,” Elie said. By training at the site of the US Open, she hopes to pursue her dream of one day competing in Flushing Meadows, NY. She will continue playing in Pro Circuit events this summer in Sacramento, CA, Los Angeles, CA, Lexington, KY, Lancaster, PA.
For now, her sights are on New Haven, where she hopes to continue her US Open run.